On March 6th of 2017, Jeremiah Program cut the ribbon on its beautiful new Moody Campus, located in the Guadalupe-Saldana Net-Zero Subdivision. 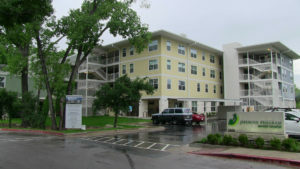 The apartment building was funded, in part, by two million dollars from the affordable housing bonds Austin voters approved in 2013. The building will provide affordable housing and free, high quality early childhood education for up to 35 single mothers and their young children. All of the residents must be pursuing a college degree so they can have a career that pays a livable wage. One of the first residents of the new apartment building is 19-year-old Marissa Martinez, a single mother of two boys. In this Keep Austin Affordable video feature, Marissa talks about the hardships of being a young single mother of two and how Jeremiah Program is not only helping her fulfill her dream of earning a college degree in the medical field, but is helping her dream even bigger.